I would definitely stay at Blue Moon Hostel again. I met people easily while staying a 6-dorm room, which was enormously big with a beautiful bath room with a good shower ánd a balcony with the best view over the city! 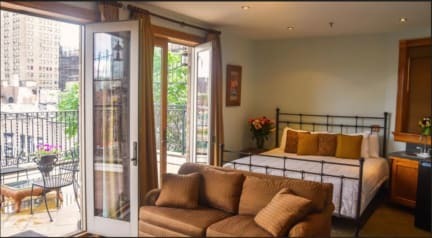 The location was great, close to the bars in East Village and close to the metro and citi bikes. One point of frustration - in our room we were not able to charge our phones at the same time, which was annoying by night and it would have been nice if you could lock the bathroom. Het hostel (meer een hotel) was prima. De faciliteiten waren goed en de buurt was erg leuk. Verder is het hotel onpersoonlijk en niet echt bijzonder. 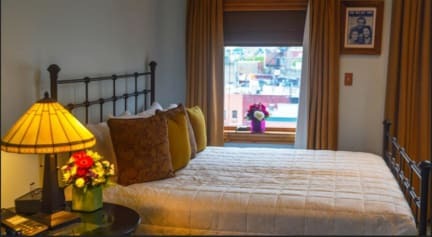 Good clean rooms on a topspot in New York. There is a small space to relaxed near the reception, but there isn't a bar or a meeting point to meet some ohter guests.. The room is clean. Bathroom is on point. The beds are to small for tall people (Dutch). I didn't like China town but that's my personal taste. Little Italy is not that far :) The staff is very unfriendly and are not willing to help. They seem to be very bored.